The National Pan-Hellenic Council, Inc. (NPHC) is a coalition of the nine largest historically African American Greek-letter fraternities and sororities*, currently representing over 1.5 million members internationally. Additionally, the organization boasts a diverse membership comprised of students, celebrities, corporate, political and community leaders. The NPHC was organized on May 10, 1930, on the campus of Howard University. For over 75 years, members of the constituent Greek-letter organizations of NPHC have convened to discuss and address issues of mutual concern. The collective social and economic power of the NPHC has been a major source of change for the African American community in America since its inception. Wright State Chapter of the National Pan Hellenic Council (NPHC) hosts seven historically African-American fraternities and sororities here on campus. The organizations include Alpha Phi Alpha Fraternity, Inc; Alpha Kappa Alpha Sorority, Inc; Kappa Alpha Psi Fraternity, Inc; Delta Sigma Theta Sorority, Inc; Phi Beta Sigma Fraternity, Inc; Zeta Phi Beta Sorority, Inc; and Sigma Gamma Rho Sorority, Inc. These organizations provide opportunities for undergraduate students to become involved as active figures on and off campus, upholding the principles these organizations were established on several years ago. On May 10, 1930, on the campus of Howard University in Washington DC, the National Pan-Hellenic Council was formed as a permanent organization with the stated purpose and mission of “Unanimity of thought and action as far as possible in the conduct of Greek letter collegiate fraternities and sororities, and to consider problems of mutual interest to its member organizations.” These problems of mutual interest derive from the need to raise community awareness and action through educational, economic, and cultural service activities. 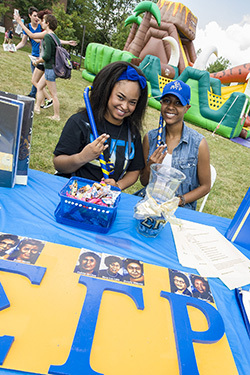 Wright State's fraternities and sororities are always looking for new members who exhibit interest in the organizations and the goals for which they strive to achieve. As newcomers to college, it is definitely useful to become informed on Greek life, observing the organizations on campus and finding out what they can do for you. This year NPHC will host its second annual Academics Decoded Series - these events will be held on Wednesdays during the first 6 weeks of classes in the Student Success Center. Get the tools YOU need to prosper in the classroom and beyond! Please follow the social media accounts for more information. @Wright_NPHC on Twitter, wrightstate_nphc on Insta. We look forward to meeting you all on campus this fall, and hope you have a wonderful year here at Wright State University! If you would like to find out more about NPHC fraternities and sororities please watch for our NPHC Open House and Open Forum events. 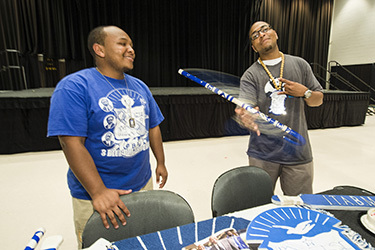 NPHC organizations participate in membership intake, the process of selecting, educating and initiating new members, at a time deemed specific by the specific organization. Membership intake is highly regulated by each of the national organizations. Generally, Students must have a minimum GPA of 2.5-2.75 on a 4.0 scale; be involved in a leadership role on campus; and actively performing service in the community. NPHC groups do not accept first semester freshmen. Aspirants, or interested persons, should note that individual organizations hold informational meetings throughout the school year. These meetings will be advertised throughout various locations on campus and will provide aspirants with the opportunity to learn more about an organization and perhaps get specific intake questions answered. Students who are interested in learning more information about the entire council are encouraged to attend the annual NPHC Open House.